At the end of a horrible October, stocks responded to deeply oversold conditions, steady earnings performance and favorable seasonal factors to defend the market's long-term uptrend. The S&P has hustled right up to a crucial level that will determine if this is a mere bounce, or if the script for an October bottom and year-end rally is playing out. The next few weeks will be the test of whether the stock market can notch a record tenth straight calendar year of positive returns. People with umbrellas pass by bull and bear outside Frankfurt's stock exchange during heavy rain in Frankfurt, Germany, November 20, 2017. The stock market passed a crucial test last week, and now faces another one. 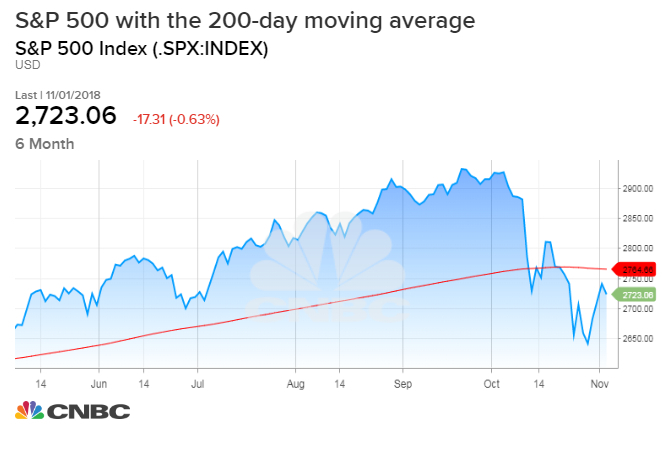 The S&P 500 found a strong bounce where it had to — preserving a 2½-year uptrend and allowing the steep October drop to be viewed, for now, as simply a swift correction in a slowing but abiding bull market. Now, at about 1 percent higher from where it sits right now, the S&P 500 will confront a cluster of technical levels including its 200-day average that could define for technical traders whether this was just a bounce or something better. Make no mistake, though, the bounce was strong. After last Monday's deeper setback to a seven-month low, the S&P strung together three straight 1 percent daily gains. 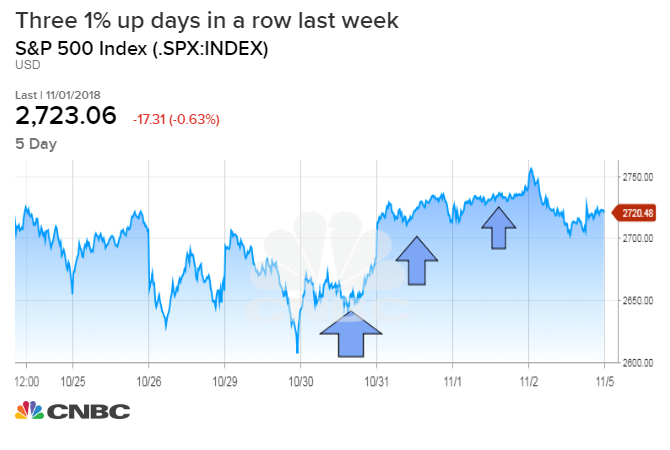 As Instinet technical strategist Frank Cappelleri pointed out midweek, this had only happened three prior times since 2010 — each at important market lows (in 2011, February 2016 and June 2016). Michael Shaoul, CEO and portfolio manager at Marketfield Asset Management, pointed out, "All we can say so far is that [last] Monday's accelerated drop lower found good support for the SPX just above 2600, and any subsequent retest should at least struggle to penetrate this level. A breach would indicate a full test of the February low at 2530 was in order, although we would use the big round number just below. If the recent bounce is to extend into November then key resistance would come into play at the 200-day [moving average] at 2765." The market proved it could respond to severely oversold conditions and what's traditionally the strongest four-day stretch of the calendar — the final two of October and first two of November. It also benefited from a strong consensus that the passage of the midterm elections would be a bullish catalyst, and so buyers likely tried to get ahead of this expected move. Front-running a collective belief that an election-cycle pattern will kick in might not seem the sturdiest bullish thesis. But it's also true that October's decline was exacerbated by aggressive liquidation by hedge funds racing to cut risk exposures — a process that seemed largely done by early last week. And with the typical stock down some 20 percent and earnings coming in OK and downward revisions to fourth-quarter profit forecasts no worse than average, according to FactSet, there was also fundamental cover for rebuilding some equity exposure. In many ways, the standard upbeat take on stocks at the late September highs — "Earnings are good, the economy humming, credit markets firm, Treasury yields not yet too high, valuations OK" — didn't change much. What did change were stock prices, to the tune of nearly 10 percent at the index level, and the investor mood which follows prices. Cappelleri notes that the prior three-day streaks of 1 percent gains carried a bit higher in days and weeks to come but then chopped down and sideways a bit before the market resumed strong upward progress. Aside from the technical setup, the market is being tested by the familiar mix of concerns — activated nine months ago — over the economic cycle's durability, the valuation pressure from higher bond yields and the Federal Reserve's interplay with both. The very strong employment report Friday crystallized these issues. A tight labor market and quicker wage growth seem to ratify the Fed's stated determination to raise short-term rates in December and perhaps three times next year. Many investors have been hoping for the Fed to find an excuse to ease off that plan. Meantime, the economic indicators that more closely correlate with S&P 500 profits and stock performance — global manufacturing indexes and housing activity, for instance — have been softening. The stock-bond relationship is a rocky one, too. Treasurys barely rallied at all during stocks' nasty October swoon, and indeed a 60/40 stock-bond portfolio would have lost a jarring 3 percent during the month. Consider three prior times this year when the S&P 500 sat at its current level of 2,723: On Jan. 4, the 10-year Treasury yielded 2.45 percent; May 10 the yield was 2.97 percent; July 3 (at the start of a strong summer rally) it was 2.84 percent and now the 10-year is near its multiyear high at 3.21 percent. Moderately higher yields don't preclude further upside for stocks, but they arguably create a lower ceiling on valuations and feed into cost pressures on indebted companies. And while focusing on tests, if the market is to play along with hopes of a year-end upside flourish, might it have to do so without Apple carrying much of the load? The punishing response to Apple's results and guidance follows a similar rebuke of Amazon after its earnings a week earlier. The action really leaves only Microsoft as a mega-cap tech leader hanging tough near its highs. Sure, capitulation by investors who were "hiding" in Apple can be a step in the process of creating a better market low. But not necessarily a decisive or final step. Last week's whippy index moves in response to floated headlines on China trade talks show both a twitchy reflex to buy on perceived good news, but also a somewhat worrying sense that investors feel they need the cover story of "trade peace" to energize risk appetites again. So the proving ground for this market has been laid out for the bulls. There are still seasonal tailwinds to hope for, and the market is certainly less expensive than it was the day summer ended. The next few weeks will be the test of whether those factors are enough for the bulls to ace these tests and notch a record tenth straight calendar year of positive returns for stocks.